There’s no getting around the fact that Americans as a whole could be in better shape. More than two in three American adults are considered overweight or obese, according to the National Institute of Diabetes and Digestive and Kidney Diseases. But getting in shape is not easy. Fast food tempts the would-be dieter, gyms are often crowded and unappealing and after a long day at work it’s hard to muster up the energy to work out. 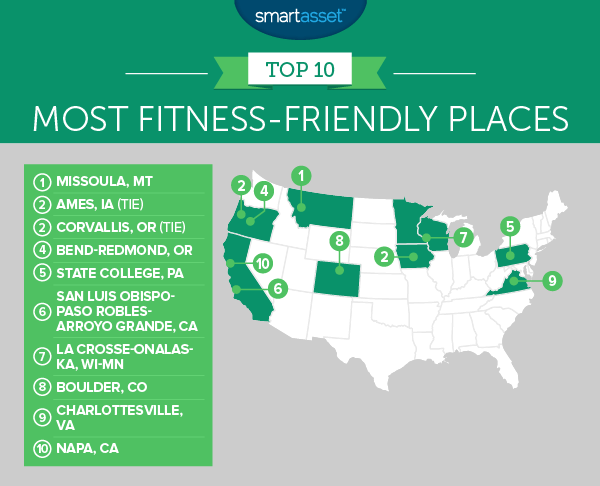 This is SmartAsset’s third annual study of The Most Fitness-Friendly Places in America. Read last year’s version here. Although everyone faces those obstacles, some places in America make it easier to get, and stay, in shape. In order to determine the most fitness-friendly places, we looked at factors like the percent of commuters who walk or bike to work, the concentration of fitness professionals, the concentration of fitness businesses, the concentration of fast food places and the hourly rate for personal trainers. For more on where we got our data and how we put it together, read our data and methodology section below. Lots of movement – Four of last year’s top 10 areas lost their spots in this year’s analysis of most fitness-friendly places. But most did not fall too far. Boston and Fort Collins, Colorado, for example, fell out of the top 10 but stayed in the top 20. Fitness-unfriendly South – Nine out of the bottom 10 places are in the South. Metro areas in Texas, Georgia and Alabama all make frequent appearances at the bottom of our list. College towns are great for fitness – Many of the most fitness-friendly places, like Missoula, Ames and Corvallis, are home to major public universities. Missoula has ranked in the top 5 every year we’ve done this study, including back-to-back first place finishes. Missoula has mostly improved on last year’s numbers. This year’s data shows that Missoula has 36 fitness professionals per 10,000 workers and 137 fitness centers per 10,000 businesses. Both of those metrics are higher than last year’s. In fact, Missoula has the highest concentration of fitness businesses in the country so residents don’t need to go far to find a recreation or fitness center. All things considered, it’s not surprising that we’ve also highlighted Missoula as a top city for an active retirement. A newcomer to the top 10, Ames climbed all the way up from 17th last year to second this year. The main reason for the climb is the increase in fitness professionals. Last year’s study found that per 10,000 workers you could expect to find 23 fitness professionals and that number has now shot up to 37 fitness professionals. People in Ames may want to watch out though: 43% of restaurants are categorized as fast food places, the worst rate in the top 25. But if you’re looking for a structured workout with a personal trainer, you’d be hard-pressed to find better deals than the ones you would get in Ames. The personal trainer rate is a bit less than $12 an hour on average. That’s the least expensive in the top 25. Heading to Iowa? Find out how your taxes will be affected. Corvallis, tied with Ames for second, is another area that we have singled out in the past as fitness-friendly. The most impressive fitness metric in Corvallis is its high percentage of workers who opt for a healthy commute. A full 17% of commuters in Corvallis either bike or walk to work. That statistic is impressive in its own right, but it becomes even more so when you compare it to other areas. The second- and third-ranked cities for the commuting metric have scores of 11%. That means Corvallis’ score is roughly 50% higher than its closest competitor. While Bend-Redmond and Corvallis are pretty close to each other geographically (and in ranking), they are fitness-friendly for slightly different reasons. Corvallis is great for walking and biking to work but Bend-Richmond scores higher in fitness professional concentration and fitness business concentration. In terms of access to fitness, Bend is one of the best areas in the country. It ranks fourth in concentration of fitness professionals and eighth in fitness businesses concentration. State College, Pennsylvania climbed three spots from last year’s study. It improved on last year’s score by increasing the fitness business concentration and decreasing the fast food concentration. The fitness businesses concentration in State College rose to 94 from 86, and the fast food concentration dropped from 43% to 41%. If you know you need some extra motivation at the gym, State College is one of the better places in our top 25. The average rate of fitness professionals here is the third-lowest in the top 10. This is a metro area just west of the Santa Lucia Mountain Range. San Luis Obispo was one of the first cities in the world to place a ban on indoor smoking in public places, including bars and restaurants. San Luis Obispo-Paso Robles-Arroyo Grande scored particularly highly for healthy dining options in our study. Only 35% of restaurants in the area count as fast food. This is consistent with last year’s score. This area is located along the Mississippi River, where hunting and fishing are popular outdoor activities. La Crosse-Onalaska is the second-most affordable place to hire a personal trainer in our top 10. And there are 31 fitness professionals per 10,000 workforce members. La Crosse-Onalaska also has the 29th-highest rate of people biking or walking to work. In addition to being fitness-friendly, Boulder is the least-stressed city in America. Like the other college towns in our top 10, many people get to work in a fitness-friendly fashion. About 9% of Boulder commuters head to work on foot or by bike. Boulder also has 101 fitness businesses per 10,000 businesses. That’s one of the higher concentrations in our top 25. Boulder took a hit on the average hourly rate for a personal trainer. The hourly wage for trainers there is about $25 on average, the second-most expensive rate in our top 10. But if you’re the type of person who prefers to work out alone, Boulder may be a great fit for you. Check out Colorado mortgage rates. The historic city of Charlottesville is home to the University of Virginia. It’s also a newcomer to our top 10, having jumped seven spots from last year’s ranking. Charlottesville has the 15th-highest concentration of fitness professionals and the 18th-lowest concentration of fast food places. Unlike other college towns, only 5% of commuters get to work in a fitness-friendly manner. Renowned worldwide for its wine region, Napa is also great for fitness. The California hotspot has the sixth-highest concentration of fitness professionals as well at the 26th-highest concentration of fitness establishments. And given that Napa is wine country, it’s not surprising that only 31% of its eating joints fall under the fast food classification. That’s the lowest rate in the top 10. Concentration of fitness professionals. This is the number of people who work as a nutritionist, recreational therapist, athletic trainer, fitness trainer, dietitian or aerobics instructor per 10,000 members of the workforce. Data comes from the Bureau of Labor Statistics. Concentration of fitness businesses. This is the number of sporting goods stores, recreation centers and fitness centers per 10,000 businesses. Data comes from the Bureau of Labor Statistics. Concentration of fast food restaurants. This is the percentage of all restaurants that are classified as fast food (or limited-service) restaurants. Limited-service means a restaurant does not have table service. Data comes from the U.S. Census Bureau’s 2014 Business Patterns Survey. Population who walks or bikes to work. This is the percentage of commuters who either walk or ride their bike to work. Data comes from the U.S. Census Bureau’s 2015 5-Year American Community Survey. Average hourly wage for personal trainers. This is a look at the cost of receiving personal fitness instruction in the area. Data comes from the Bureau of Labor Statistics. We ranked each metro area by these five metrics. We then averaged each ranking, giving half weight to the average hourly rate for personal trainers and full weight to all other factors. We then assigned an index score based on that average. The metro area with the highest average received a score of 100 and the metro area with the lowest average received a 0.